We offer free listings on our finda wedding directories and if you like what we're doing we'd really appreciate a short blog post about us or if you have a links page or resources page then it would be nice to add us to your site in an appropriate place. If you want to link to us we've provided some handy code and badges but you can make the link anyway you like. Let us know if you've added a link and we'll also 'like' or google+ your homepage. 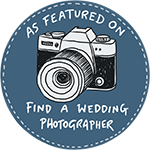 If you are a wedding photographer you can also mention us in your blog and link to us that way!